The Club Championship is our own Beer Judge Certification Program (BJCP) registered competition, held annually, and open to BABBs members only. Being BJCP registered means that is run to a strict set of guidelines, and uses BJCP accredited judges. The competition is a great way to receive reliable feedback about your beers, and have a chance to win some nice prizes. 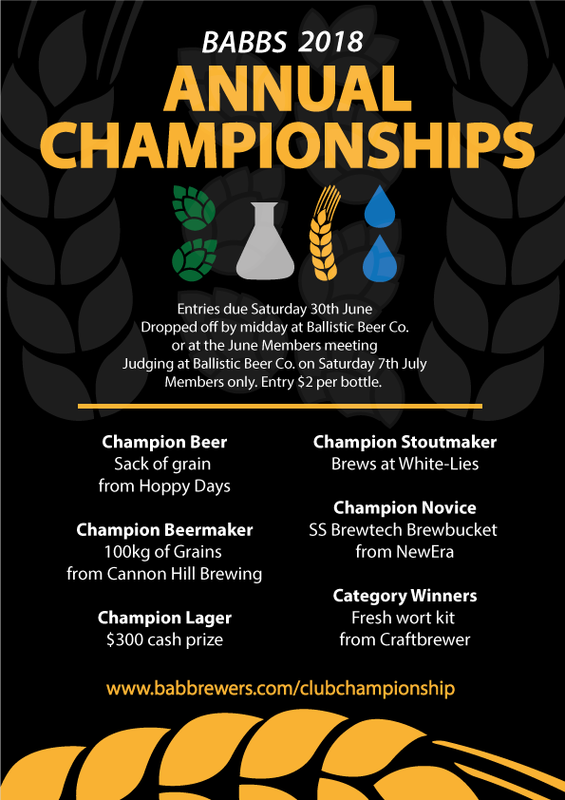 The comp is held in the lead up to Queensland Amateur Brewing Championships (QABC), and as such provides valuable feedback for those going on to state level. The Club Championship also serves an important educational role in the club by helping members learn about competition entry, training new judges and stewards, and improving the experience of current judges. These styles correspond to the BJCP 2015 Style Guidelines, and will be judged accordingly. The BJCP guidelines should be consulted for style descriptions and style specific entry requirements. Link to BJCP 205 Guidelines.